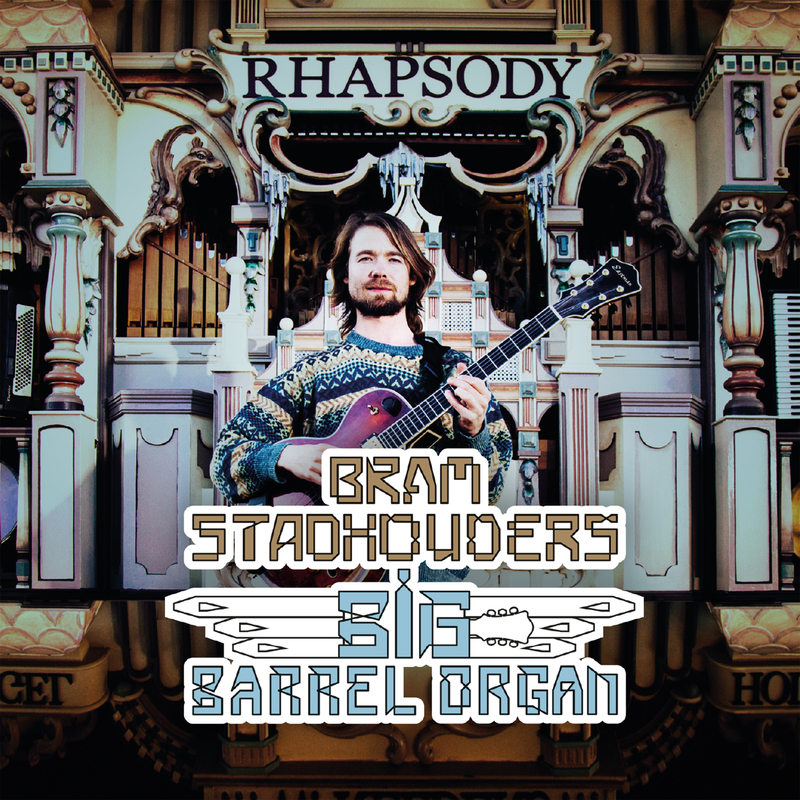 On this album, Bram Stadhouders & The Big Barrel Organ guitarist Stadhouders plays the biggest transportable dancehall organ in the world, The Rhapsody, using guitar and MIDI, mixing composition and pure improvisation. The musician is the first in the world to do this, which is why he can be called the first dancehall organ guitarist. It is a crazy and adventurous project. The history of dancehall organs goes back to 1850, when the first dance organs were made. In Belgium and the south of Holland especially, the organ became immensely popular as a precursor of the jukebox. In cafés, fairs and dancehalls, the organs were playing the latest hits. Besides the many organ pipes, dance organs are often equipped with extra instruments such as accordions, percussion and saxophones. Between 1910 and 1930, thousands of dance organs were built. You could find one in almost every dancehall. However, as the loudspeaker made its way into the public, these organs were banned to museums or private collectors. Guitarist Bram Stadhouders thinks that’s a shame, so he went on an investigation. After playing on the dance organ The Busy Drone in Orgelpark Amsterdam, he discovered that many dance-organs now work with MIDI, which means you can play them with any instrument that can send MIDI. As he went on to look for a transportable dance organ, he found The Rhapsody, which was only a stone’s throw from his birthplace Tilburg in the south of Holland. The Rhapsody organ is 7 meters long and 5 meters high, has more than 800 organ pipes, 12 percussion instruments as well as 2 accordions, and weighs more than 5 tons. “When composing contemporary music for these organs, you hear totally unique sounds, a mix between electronic and acoustic sounds. The dance-organ is really the first synthesizer. The way we choose sounds on any synthesizer is derived from the barrel organ,” says Stadhouders. The guitarist feels that he’s “made for this project”, a concept that he’s been waiting for all his life. Beste heer Elzinga, u kunt deze Cd downloaden via iTunes. U kunt de CD fysiek bestellen voor de hoogste kwaliteit. "It is not a guitarist that uses the organ as accompaniment, it's s the other way around: Stadhouders is moving the Rapsody with the guitar and laptop ... Stunning." "'The Rhapsody' is a technical masterpiece and a model of experimentation and creativity"
"Improvised music with a barrel organ. That may sound like something impossible, but Bram Stadhouders proves that it can be done. And that it may not be as difficult as it seems." "In all cases, the guitarist demands a unique place in the world of music for this project."